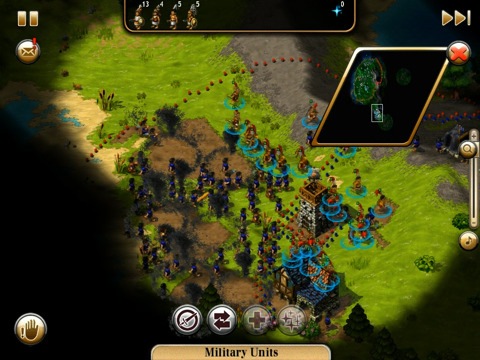 When word got out that Gameloft was adapting The Settlers HD for the iPad cult gamers waited with bated breath. Gamers have gathered slow paced civilization simulation game since 1993 so when the iPad reincarnate was released it quickly accelerated to the app store’s Top lists. The highly detailed HD version of the game looks decent on the iPad and the game still operates in the same vein. In addition to building a sustainable town complete with army barracks, mines, marketplaces and much more, this highly detailed game puts you at the helm of building complete infrastructures before going to war against other early civilizations. All said and done, not much has changed from the original version of the game. The iPhone and iPad versions don’t require you to build your own roads, but most everything else stays the same for The Settlers HD. While this loyalty to the original version of The Settlers is certainly appealing, it feels like the app doesn’t do much to take advantage of the iPad. Instead of letting you pinch to zoom, the game still features a limited sidebar zoom slide that only works reasonably well. Figuring out the menus is simple enough, but it feels like the game could have employed a few swipes or shake to fast forward type touches to the game. All said and done, The Settlers HD offers the expected and nothing more. People who already own the game on the iPhone or iPod Touch won’t see many changes (other than a much bigger screen) with the iPad version. 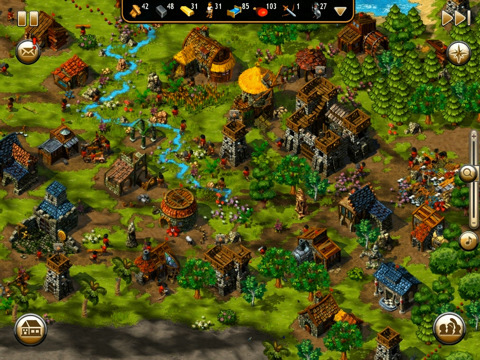 Newcomers and The Settlers fans who enjoy history based strategy games may relish in the game though. The highly detailed interface that forces you to make decisions about every nuanced building location, society size, and even the rate at which your civilization expands is incredible. In this way The Settlers HD is extremely immersive. The unavoidable and somewhat painstakingly guided tutorial for the game takes at least 30 minutes to complete and feels more like a chore than anything else. The highly detailed choices between different mines, barracks, food buildings and more make the tutorial feel necessary though, and when the game finally sets you free it’s amazing how immersive The Settlers HD can become. A message circle in the upper left hand corner lights up with general tips on how to effectively build your society, but the game mostly lets you discover the nuances of running an effective society on your own. Like many simulation games, half of the fun is in building and preparing. Then you go to war and everything ratchets up a notch. Overall, the graphics for the game are decent. The soundscape is wonderful, and the game is immersive. 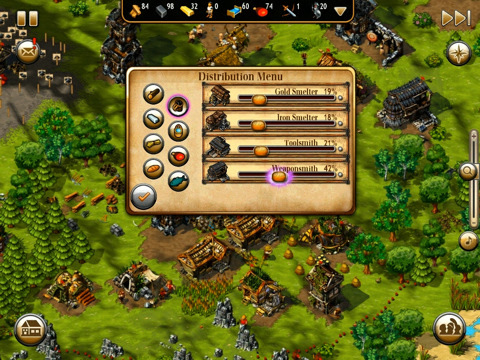 I just wish they would have used the iPad’s advantages more heavily in designing this adaptation of The Settlers. Bottom Line: The Settlers HD is a famous civilization creation and warfare game adopted for the iPad with decent play all the way around.